US economic growth stumbled in this year’s first quarter, according to this morning’s estimate from the Bureau of Economic Analysis (BEA). The government’s first release of the Q1 GDP report revealed a weak gain of 0.5% (seasonally adjusted annual rate)–less than half the pace of the already sluggish 1.4% rise in last year’s Q4. A key factor behind the economy’s slowest quarterly advance in two years: softer consumer spending. Note, however, that the downshift in consumption on Main Street doesn’t appear to be a byproduct of deteriorating household balance sheets–a point that may plant the seeds for stronger growth down the road. 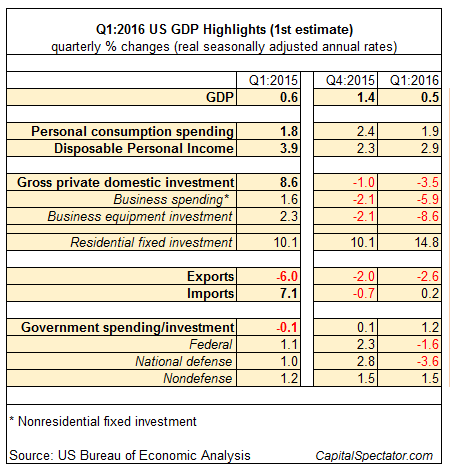 In contrast with the ongoing retreat in spending growth in Q1, disposable personal income (DPI) ticked up in the first three months of 2016 to a 2.9% quarterly gain–modestly above the 2.3% increase in 2015’s Q4. That’s still near the low end relative to the last two years, but the fact that DPI’s pace improved suggests that the consumer wasn’t feeling financially pinched in Q1 relative to Q4. Pinched or not, the urge to spend continues to show signs of waning, which for the moment is the bigger headwind for the economy. Spending’s retreat is far more acute in the business sector. Red ink again weighed on business spending and investment in new equipment in Q1. Residential fixed investment, on the other hand, continued to rise at a healthy rate. In fact, consumer spending on housing and related spending jumped up to 14.8% in Q1—the highest rate in more than three years. The question is whether there’s a Q2 rebound brewing? It’s too early to tell. The main source of optimism is the labor market, which continues to post encouraging numbers. This morning’s weekly update on initial jobless claims shows an increase for the week through Apr 23. But the latest reading at 257,000 (seasonally adjusted) is still close to a four-decade low—a clue for thinking that the economy will continue to create jobs at a healthy rate and thereby keep the macro trend out of the recession ditch for the foreseeable future. Nonetheless, today’s GDP report takes a toll on confidence. It’s unlikely that anNBER-defined recession began in Q1 (based on data through March, as discussedhere and here). But the lack of a formal recession signal through last month doesn’t preclude slow growth in the foreseeable future. On that note, the focus now turns to deciding if the disappointing Q1 data is a prelude to even darker numbers ahead. Or does the first-quarter weakness go down in history as yet another soft patch that eventually gave way to stronger growth in Q2 and beyond? No one really knows at this point, but the answer begins rolling in with some authority in next week’s update on payrolls for April. Maybe so, but it’s not particularly encouraging either.